As a part of an exciting new addition to [the Sierra Club] outings program, we are partnering with local farmers to present a series of Saturday “Lā Hana” (workdays) designed to highlight key campaign issues that affect communities around Hawai‘i. 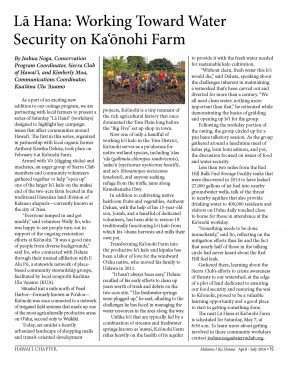 The first in this series, organized in partnership with local organic farmer Anthony Kawika Deluze, took place on February 6 at Ka‘ōnohi Farm. 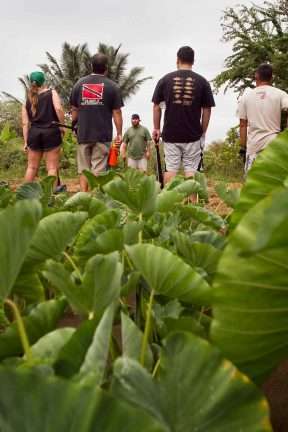 Armed with ‘ō‘ō (digging sticks) and machetes, an eager group of Sierra Club members and community volunteers gathered together to help “open up” one of the larger lo‘i kalo on the makai end of the two-acre farm located in the traditional Hawaiian land division of Kalauao ahapua‘a—currently known as the city of ‘Aiea. 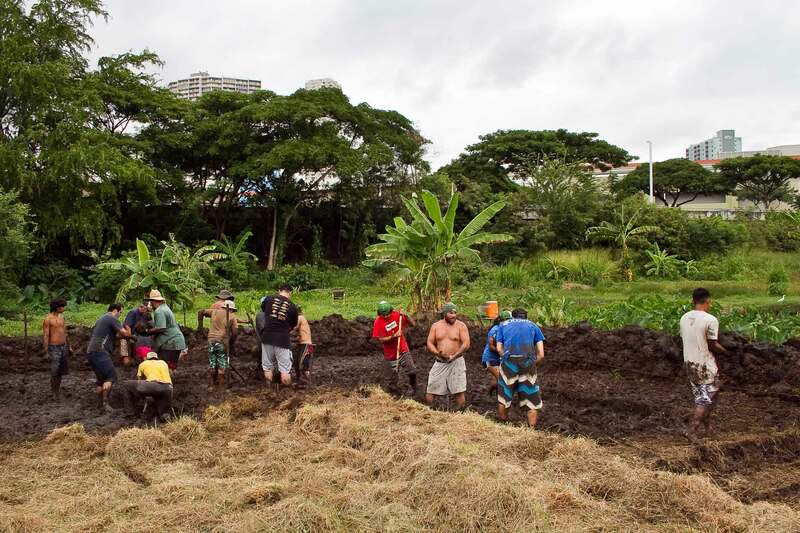 “Everyone jumped in and got muddy,” said volunteer Wally Ito, who was happy to see people turn out in support of the ongoing restoration efforts at Ka‘ōnohi. 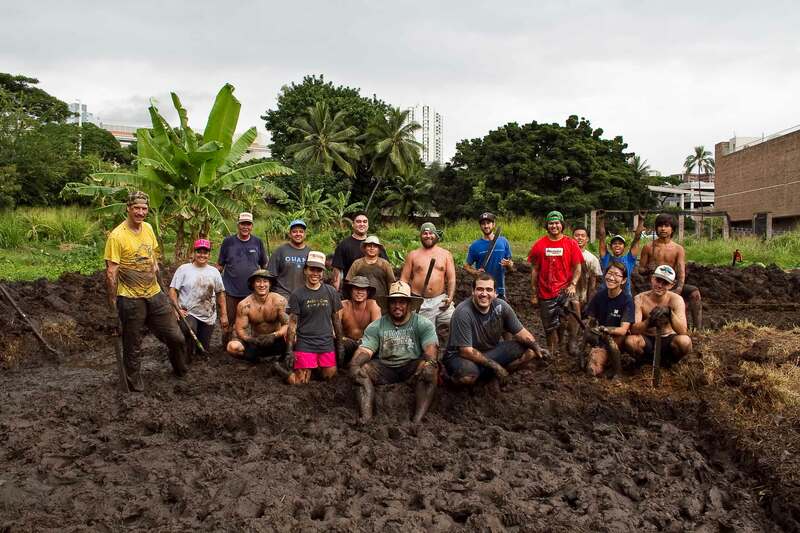 “It was a good mix of people from diverse backgrounds,” said Ito, who connected with Deluze through their mutual affiliation with E Alu Pū, a statewide network of place- based community stewardship groups, facilitated by local nonprofit Kua‘āina Ulu ‘Auamo (KUA). Situated just a mile north of Pearl Harbor—formerly known as Pu‘uloa— Ka‘ōnohi was once connected to a network of irrigated field systems that made up one of te most agriculturally productive areas on O‘ahu, second only to Waikīkī. Today, set amidst a heavily urbanized landscape of shopping malls and transit-oriented development projects, Ka‘ōnohi is a tiny remnant of the rich agricultural history that once dominated the ‘Ewa Plain long before the “Big Five” set up shop in town. Now one of only a handful of working lo‘i kalo in the ‘Ewa District, Ka‘ōnohi serves as a pu‘uhonua for native wetland species, including ‘alae ‘ula (gallinula chloropus sandvicensis), ‘auku‘u (nycticorax nycticorax hoactli), and ae‘o (himantopus mexicanus knudseni), and anyone seeking refuge from the traffic jams along Kamehameha Hwy. 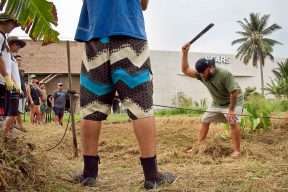 In addition to cultivating native heirloom fruits and vegetables, Anthony Deluze, with the help of his 15-year-old son, Josiah, and a handful of dedicated volunteers, has been able to restore 18 traditionally functioning lo‘i kalo from which his ‘ohana harvests and mills their own poi. 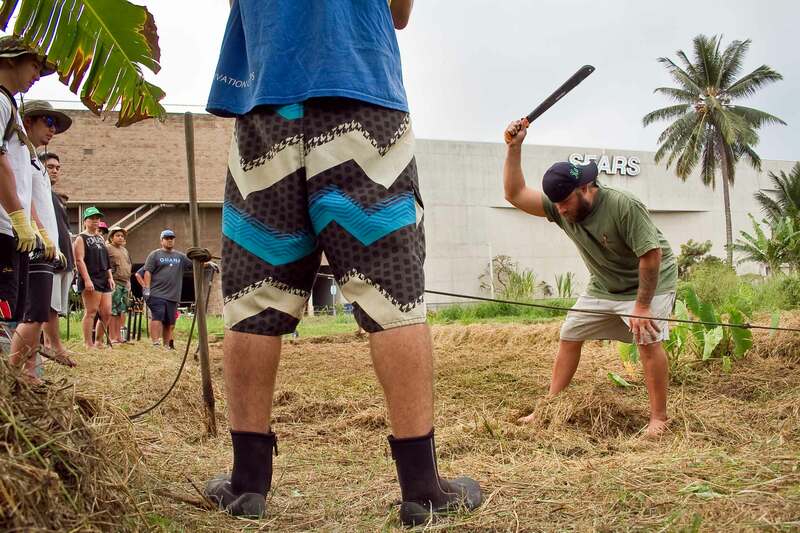 Transforming Ka‘ōnohi Farm into the productive lo‘i kalo and kīpuka has been a labor of love for the windward O‘ahu native, who moved his family to Hālawa in 2011. “It hasn’t always been easy,” Deluze recalled of his early efforts to clean up years worth of trash and debris on the two-acre site. “The freshwater springs were plugged up,” he said, alluding to the challenges he has faced in managing the water resources in the area along the way. Unlike lo‘i that are typically fed by a combination of streams and freshwater springs known as ‘auwai, Ka‘ōnohi Farm relies heavily on the health of its aquifer to provide it with the fresh water needed for sustainable kalo cultivation. “Without clean, fresh water this lo‘i would die,” said Deluze, speaking about the challenges inherent in maintaining a watershed that’s been carved out and diverted for more than a century. “We all need clean water; nothing more important than that,” he reiterated while demonstrating the basics of gridding and opening up lo‘i for the group. 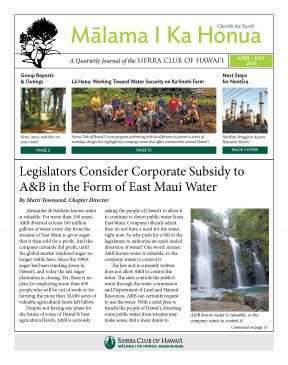 Less than two miles from the Red Hill Bulk Fuel Storage Facility tanks that were discovered in 2014 to have leaked 27,000 gallons of jet fuel into nearby groundwater wells, talk of the threat to nearby aquifers that also provide drinking water to 400,000 residents and visitors on O‘ahu daily touched close to home for those in attendance at the Ka‘ōnohi workday. “Something needs to be done immediately,” said Ito, reflecting on the mitigation efforts thus far and the fact that nearly half of those in the talking circle had never heard about the Red Hill fuel leak. Gathered there, learning about the Sierra Club’s efforts to create awareness of threats to our watershed, at the edge of a plot of land dedicated to ensuring our food security and restoring the wai to Kā‘onohi, proved to be a valuable learning opportunity and a good place to start in getting something done.